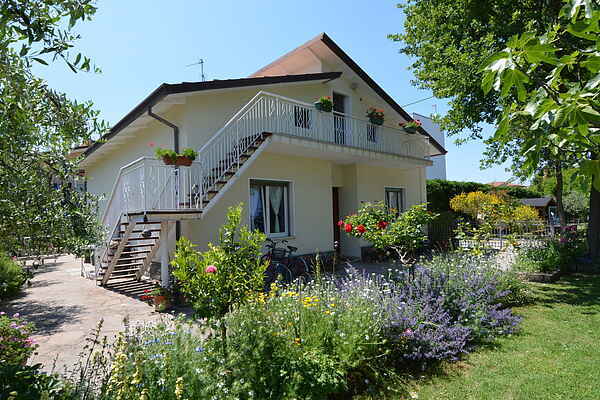 This attractive holiday home is 800 metres from the beaches of the Adriatic Coast. It is in the popular village of Gatteo Mare. The holiday home is in a terrace and has a 195 m2 private garden. Olive and fruit trees surround the house. You can enjoy a wonderful holiday here near the beach, the beautiful sea and the village. The area has a number of interesting attractions. These include the towns of Bellaria-Igea Marina, Cervia, Rimini and Riccione. You can also explore inland and visit historic Ravenna, Forlì, Cesena and the unique mini state, the Republic of San Marino. Gatteo Mare is situated in the middle of the Adriatic Riviera, between beautiful and historic Cesenatico and Cervia to the north and Rimini to the south with it’s never –ending beach and interesting city centre. The apartments are within easy walking distance (less than 10 mins) of the sea. At the beach are many bathing establishments offering all services – beach beds, umbrellas, bars and restaurants, beach volley, boules and boating, ideal for families. In Gatteo Mare itself you will find small supermarkets, touristy shops, bars and restaurants, on Monday mornings a large market is held in the streets. Go to the tourist office in the main square for information on events and festivals in the area. But the Romagna region has more to offer than just a beach holiday. The Appenine Hills only 20 kms away are home to many spectacular and ancient hilltop fortresses and towns, such as San Marino,Verucchio, Santarcangelo di Romagna, San Leo and Gradara. All are worth visiting to see the castles, wander the steep and narrow cobbled streets, visit the museums and eat well and drink Sangiovese di Romagna wine at the numerous restaurants. In the hills you will also find wine producers and agriturismo restaurants which use their own grown produce. For more culture the city of Ravenna is only 25 kms away, drive or take the nearby train to see the famous mosaics. Ferrara and Bologna are also in the region and are interesting to visit. 80 kms further south is the spectacular hilltown of Urbino, with art galleries, palaces, and the artist Rafael’s house. Throughout the year are many events nearby, cycling (Nove Colli and the Tour of Italy), the vintage car race, the Mille Miglia, numerous markets and festivals celebrating seasonal produce, wine, fruit , cheeses and all types of food.